It is important to check the tire pressure of your vehicle regularly avoid uneven wear on your tires. The air pressure of your tires should be checked about once a month or if your tire pressure indication light comes on on your car’s dashboard. Damage can result from improperly inflated tires. Excessive wear on the shoulder of the tire is a result of under inflation and excessive wear on the center tread of the tire is a result of over inflation. Checking you tire pressure is easy, but first you are going to need a pressure gauge. You can buy a pressure gauge at practically any retail store or gas station for only few dollars. Before using the gauge to get a reading, make sure it is working properly to avoid over or under inflating your tires. You’ll need to know how much air your tires need before you can check the pressure. This information is easy to find out. Just open your car door on the driver’s side and check the doorjamb for a sticker that displays the correct tire pressure (in PSI) for your front and back tires (the front and back tire pressures may differ depending on your vehicle). After establishing the correct PSI to look for, it’s time to check your tires. First unscrew the valve caps and then firmly press the nozzle of the gauge against the tire valve under to air is leaking out. After you’ve gotten your reading, inflate the tires as need and then put the valve caps back on. 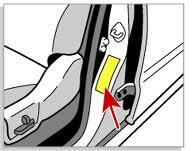 Posted in Car tips on February 11, 2014 by American Engine Installations.